A&W has been an institution in the US and Canada for countless of years. 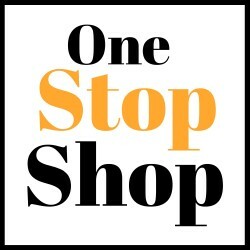 It has been a fast food chain that I have enjoyed going to since I was a child. Amber, our daughter has also enjoyed this restaurant but she is not a burger fan! Luckily A&W had more to offer than just burgers and one thing she loved was their Whistle Dogs. Her and Ken were flabbergasted when they went in to order her beloved hot dog and found out they no longer offer it. WHAAAAAAT????!!! How could this be???!! Ken and Amber came home disappointed and decided to make their own Copycat Whistle Dog!! There are just a few things A&W did to make this hot dog really good. They sliced it in half and grilled it that way. They kept the condiments to a minimum, relish, bacon, and cheese. We added in the little bit of white onion as it adds so much to the hot dog but you can omit that. Plus, they toasted the bun. No ketchup or mustard on this dog!! This is how is arrived!! And man are they good!! Crisp Bacon is the Key!! I believe the Whistle Dog was unique to the Canadian menu only. But now all of you can make this excellent treat for your family. It sure is loved here. We cook up the bacon in the oven to a perfect crispness. Don’t know why we haven’t done that for years. It is the only way to cook it!! So little mess and you are free while it cooks too!! 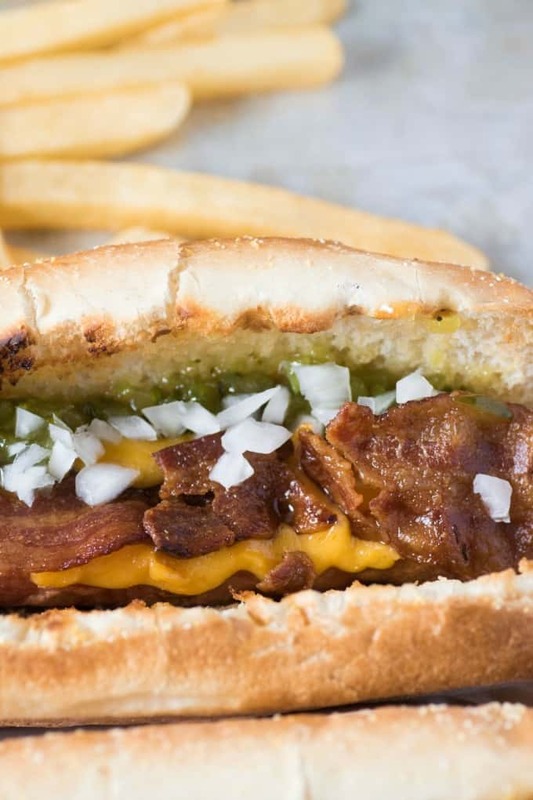 This Whistle Dog would be great for lunch or dinner this summer or anytime. Cooking the hot dog is easy on the grill or stove top on a flat iron grill or cast iron pan. The toppings are easy but an excellent combination of flavors! Add some fries to the order and you feel like you are back at A&W!! 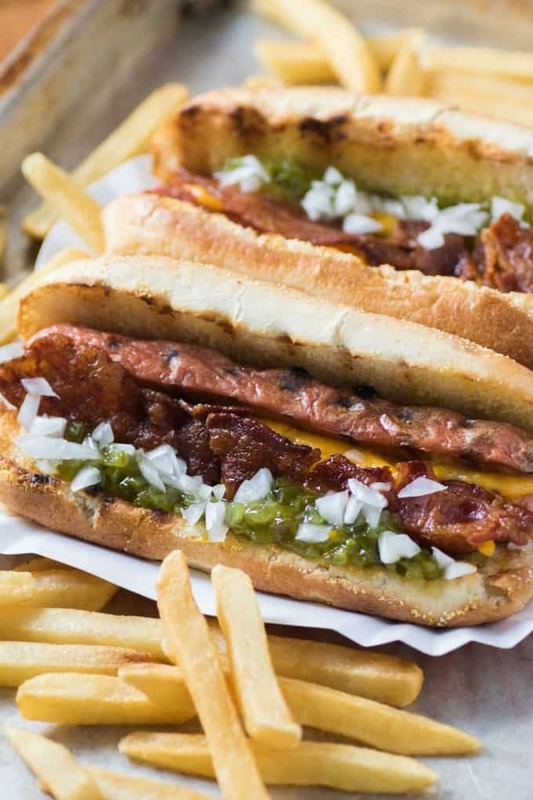 Try one of these delicious dogs today!! Even if it wasn’t part of your childhood memories you can make some memories now!! There is nothing better than a great hot dog. Your family will love you for this recipe!! This Copycat Whistle Dog is taken from A&W who no longer have this on their menu. You can now make your own at home! Heat up the bbq to medium and grill the hot dogs on both sides until nice grill marks appear. Toast the buns on the grill, open side down. 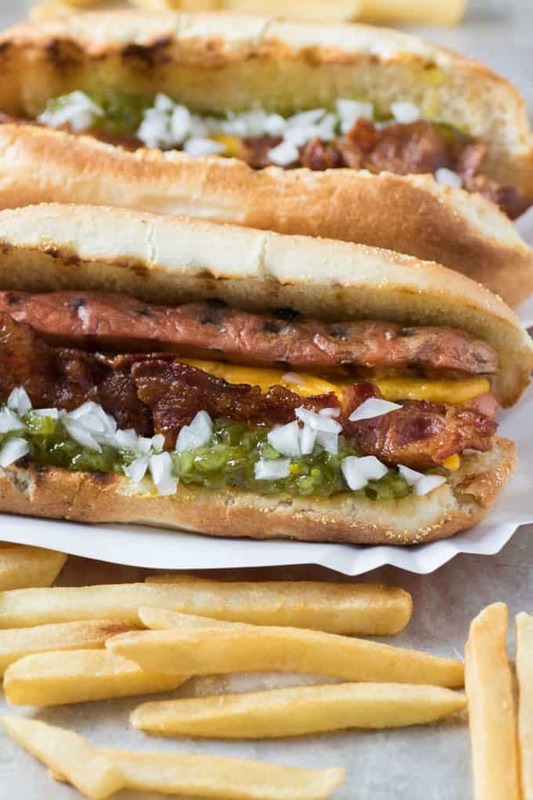 Place one hot dog in each bun and fill the hot dog with cheese. Run it under a broiler to melt. Top with crisp bacon, relish and onion if desired. Serve immediately. That looks so good! Nothing beats a good dog. I’ve never had a Whistle Dog before, but that’s going to change. Ahh! This is the most amazing dog I’ve ever seen in my life. In. My. Life! I must have this in my life. I love A&W, but have never actually tried one of their hot dogs. This looks AMAZING Tara!!! I have never heard of the whistle dog! It looks delicious so I definitely need to try it. We have one night a week where we just eat whatever and I think this week we might just do this one. The A&W whistle dog has been a favorite of mine since I was a kid. I love finding copycat recipes to try of all my favorites. I’m excited to give this recipe a try on the weekend. This recipe is everything! 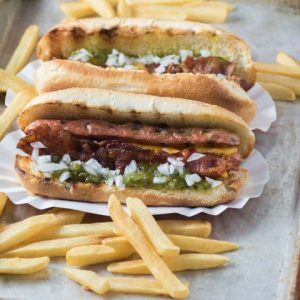 Seriously we are huge hot dog fans in our household and I have to try this recipe, like immediately or sooner. We just bought a brand of gourmet hot dogs tonight to try at the grocery store, so maybe I’ll have to cook these up for Friday night dinner. Ok, you have officially made me super hungry! I love a good dog that is loaded with toppings! These look amazing! I have not eaten at White Castle in years! My husband would love this recipe! Whoops, no it is A&W that had these hot dogs not White Castle. Don’t think we have those here in Canada. I’ve never had a whistle dog before! But, it sounds like something I missed out on. This sounds delicious! I love the idea to dress up a easy to create dish that the whole family loves. Cant wait to try this out! I don’t know if anyone in my family has tried the original but I bet they’d love this! This is an awesome summer idea for the grill! I’ve never had one of these at A & W, but it looks so delicious! I love ALL the toppings, too, so I’ll have to try this recipe the next time we’re having hot dogs. YUM! Oh YUM!! I love a good loaded hot dog! I haven’t tried this one at A&W, but I guess I can try to make it! Thanks for the recipe! Thanks for sharing I’ve decided your recipe is our plan for dinner tonight. I’m so excited. Ahhh! That is amazing! Anytime you put bacon on anything, it automatically becomes the best food ever! I cannot wait to make these this weekend. So yummy! I could easily make and eat this dish every day. It seems mouth-watering! What would you suggest trying at the A&W except for whistle dog?? I like their mama burger or the teenburger. Have grown up on those too! I love fast food never been to A&W. I think I’d love to try their fast food! Nice share, I’m feeling like have one. Thanks for the share. My 1st job was at A&W Root beer. I had never seen that on our menu nor did I ever serve one!! Sounds good, tho. Must be a regional thing!! Canadian thing I believe, my daughter loved them. We went to A & W many years ago and had (2 for 25 cents) Spanish hot dogs. Hot dogs with an onion/tomato type sauce. Looking for recipe. That is cool, but I have never had those before. Gotta love that price!! So simple, yet sooo good! I also loved their Chili Dogs. Ya gotta respect the dog! Nothing beats a great dog!! They are so good, sad they aren’t selling them anymore also!! I have never heard of this “dog” until now. Sounds yummy. We wil have this recipe this weekend. Thank you so much for sharing. p.s. I have been around for a number of years and A&W was my favorite as a child. I remember when thr root beer was makd at each location from concentrated syrup, and the employees were paid 95 cents an hour! This is kind of a hidden gem of a recipe, maybe only found up in Canada. You can also get a pancake breakfast at A&W, something that not everyone is aware of. We just ask for it at the till. A&W does bring back memories for me too. Thank you for sharing yours!! Enjoy the dog! !